Rebecca’s writing, maps, and mementos from her walk along the Camino. Photo courtesy of Morack Studios. “Tomorrow afternoon we’re going to make journals,” my writing teacher, Elizabeth Hunter, declared. I was at the John C. Campbell Folk School taking a week-long memoir-writing class. Bookmaking had not been part of the class description but my classmates and I took great joy in having something handmade in which to write after our time together was finished. 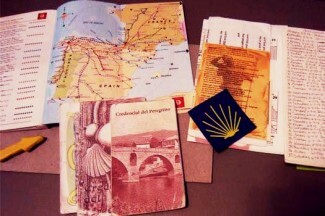 Eight months later, I prepared to depart for the Camino. I was thinking of how best to document my journey. Store-bought, bound journals weighed quite a bit, specifically their covers. My solution? Only take the guts of a journal: the paper. And upon my return, I could sew the pages into a book, just as I’d learned in that writing class. A year after my return from the Camino, the pages sat in a ziploc bag, covered in my thoughts and prayers but as yet unbound. Then my friend Lois sent me an e-mail. It contained just one line. I read it and my mouth dropped open. I jotted a quick reply: This is so true! I remembered the relief I felt a couple years ago when I pulled apart all my unfinished crochet projects, wound up all the yarn, and donated it. I was now free to start new projects without the guilt of not finishing ones I’d previously started. Lois’ e-mail came to the front of my mind a few weeks later when a colleague told me his wife, Maddy, was a bookmaker. “Does she do custom books?” I asked. “Those are her favorite ones to make,” he told me. 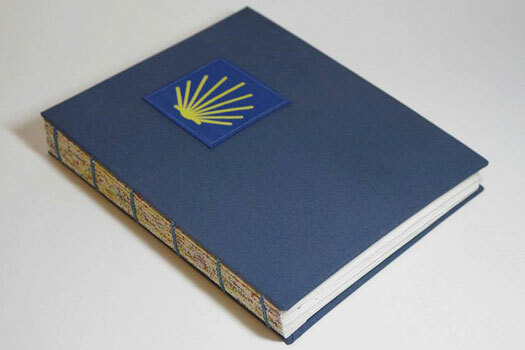 I realized the look of my Camino journal would no longer be limited by what I’d learned in my writing class. I went home and pulled out other mementos from my trip that I wanted included in the book. The prayer card given to me by the priest who greeted each pilgrim on their way out of Roncesvalles. My pilgrim passports, filled with stamps marking where I stayed along the route. The map from inside the cover of my guidebook. One of Rebecca’s unfinished projects — finished! Photo courtesy of Morack Studios. 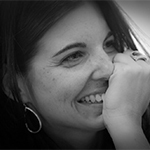 I laid out all my memories for Maddy, who was delighted to help with such a personal project. I sent her off with the pages that documented my fears, my worries, my joys, and my memories of the best trip I’d ever taken. A few weeks later, she showed me the finished project. It was better than anything I’d ever imagined it could be back when I took those pages with me to Spain. Some days it seems life is full of unfinished projects. People to be forgiven, books to be read, a job to found, a friend to be helped. But look around and notice how life provides: people, resources, opportunities. Sometimes in what appears to be divine intervention. Sometimes the projects are bigger. And so are the resources. I don’t imagine the people of Tanzania ever dreamed a computer nerd from the United States would decide he wanted to rid their country — no, their entire continent — of malaria. I don’t know that Bill Gates, when he was building computers, ever imagined he’d have the ability to do so. But it’s happening. Whether it’s something as big as eradicating malaria, or as small as finishing a book, unfinished projects do not have to sit on just one person’s shoulders. But the thought must go out there. Sometimes I put voice to my wishes, other times I tuck them into my God Box. And no matter how many times the solution comes along, I frequently find myself sitting back in amazement at what has been provided. Often the solution is something I never could have dreamed up on my own — and my finished project becomes something better than I could have ever imagined. What unfinished projects do you have? Put them out there and watch what resources become available.